New study estimates half a million casualties from Iraq War. But how reliable is it? 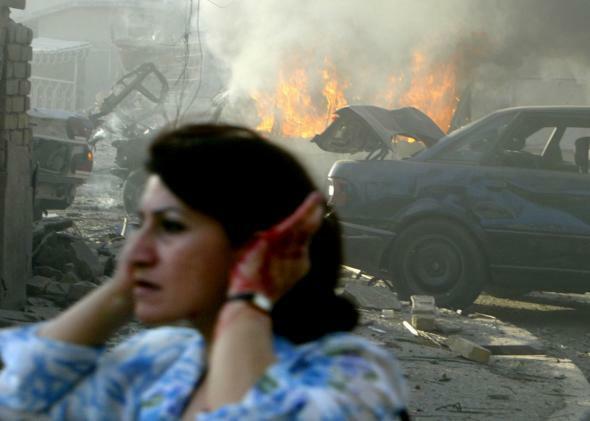 An injured Iraqi woman flees the site of two car bombs that exploded in quick succession near two Baghdad churches 01 August 2004, causing many casualties. The politically charged question of how many Iraqis were killed as a result of the war that began in 2003 has been a tough one to pin down. Former U.S. CentCom Commander Gen. Tommy Franks famously claimed that “we don’t do body counts,” though U.S. military documents released by Wikileaks in 2010 contained records of more than 100,000 people killed in Iraq following the 2003 invasion. The independent group Iraq Body Count has documented between 114,973 and 126,121 civilian deaths since 2003. But not all deaths are recorded, and what about those killed not by direct violence but by other factors caused by the war? Efforts to measure these casualties have proven more controversial. The latest effort to measure the death toll is a paper published recently by a large team of researchers in the peer-reviewed online journal PLOS Medicine. Media reports have described the paper as finding that half a million deaths were caused by the war. Of the 405,000 estimated deaths, 60 percent (240,000) were caused by violence. The rest were “associated with the collapse of infrastructure and other indirect, but war-related, causes.” Living in the middle of a warzone isn’t all that good for your health. The new article builds on a controversial 2006 study published in the Lancet which estimated that 655,000 Iraqis had been killed as a result of the war at that time. While it garnered quite a bit of attention at the time, critics, including Slate’s Fred Kaplan, criticized its methodology. So is the new study any better? Before looking into that, it’s important to understand how studies like this work. The researchers aren’t actually counting deaths; they survey randomly selected households throughout the country—2,000 of them for the new study—and ask them about their births and deaths since 2001, two years before the invasion. From these surveys, the researchers estimate the overall mortality rate in the country before and after the invasion and use it to calculate how many excess deaths were caused by the war. One of the criticisms of the Lancet study was that its sample size was too small and not geographically representative—it was still highly dangerous to conduct field research in many parts of Iraq in 2006. Today, researchers have access to more parts of the country, and the new study covered twice as many areas. The Lancet report was also criticized for surveying only homes on main commercial streets, which are more likely to be affected by fighting. The selection method in the new paper was more random. The researchers also got an impressive 98.55 percent response rate from the households surveyed. These studies are highly affected by the baseline numbers used. The Lancet survey estimated an annual mortality rate of 5.5 per 1,000 people for the two years prior to the war and 13.3 per 1,000 in the years after. Some experts were suspicious of these numbers, noting that the U.N. Population Division put the pre-war death rate at 10 per 1,000. In the new study, the numbers are quite different. The survey found a death rate of 2.89 per 1,000 in the two years before the war and 4.55 between 2003 and 2011. “As time goes on, respondents become less accurate in recalling details of the household demographics,” she wrote. Because of these factors and others, that actual estimate in the paper—as opposed to the eye-popping “half a million” figure that’s been reported, is a pretty wide range. The authors estimate with 95 percent certainty that the war caused between 48,000 and 751,000 excess deaths. Given that range, the numbers don’t seem that far off of the figures from the Iraq Body Count or Wikileaks. Ultimately, studies like these are interesting from a social science and public health perspective, but probably shouldn’t be given all that much political weight. “Only 100,000 deaths” is a morally absurd statement. And had we known in 2003 that in 2013, bombings killing 60 or more people in Iraq would still be a relatively common occurrence, I doubt the idea of invading would have been so popular.